Brothy black beans, gently seasoned, with perfectly poached eggs floating on top of little crostini toasts, finished with spoonfuls of red tomato salsa! 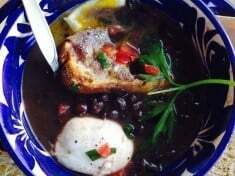 This black bean soup with poached egg is one of the many reasons I adore Mexican cuisine. 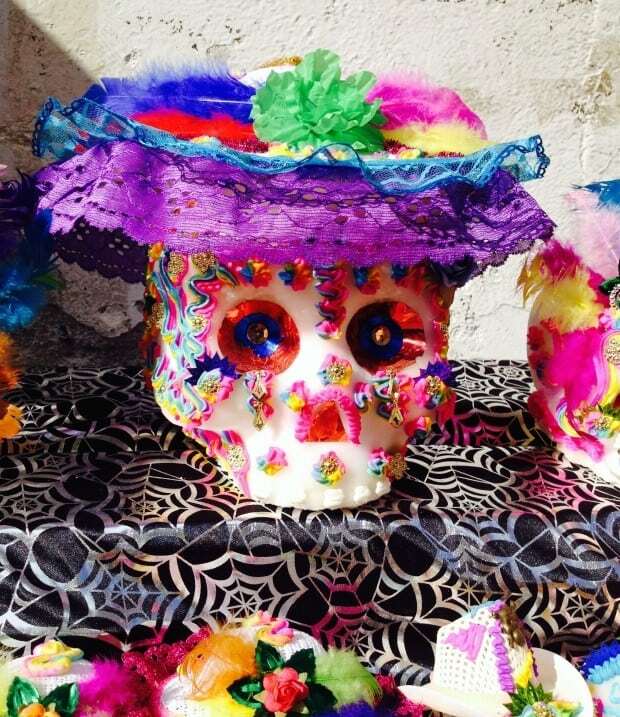 In a few days I’m headed to Michoacan Mexico with girlfriends. My mouth is already watering thinking about the food! It seems like a perfect time to re-share this simple soup inspired by a flavorful brunch dish I had a few years back. 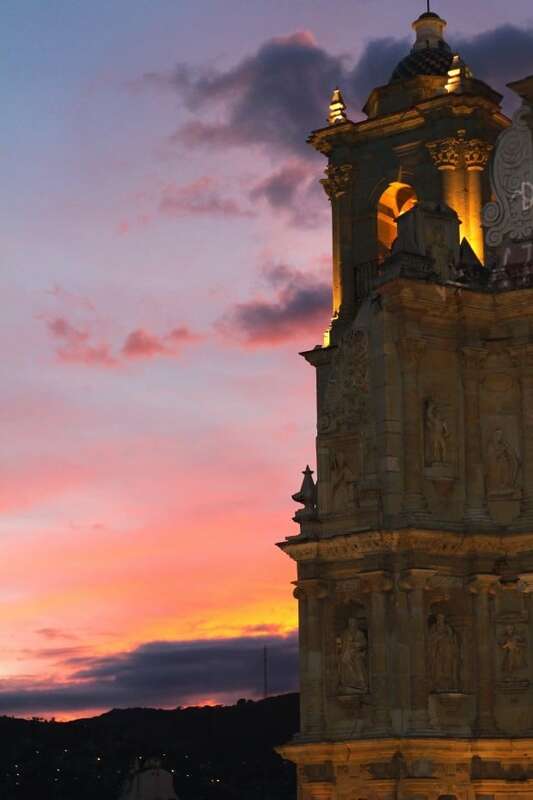 Traveling in Mexico with girlfriends, we invariably eat 2 meals a day, a late breakfast and then dinner. Mexican breakfasts are the best! Normally I order spicy scrambled eggs with green chile, onion, and tomato called huevos a la Mexicana. They come with a side of creamy refried beans and an assortment of salsas, which I proceed to spoon into the warm corn tortillas, like tacos. I wonder if that’s tacky gringo manners. In Mexico City we discovered a cosmopolitan-looking bakery-café for “brunch.” Eyeing the tempting display of “artisan” breads and well-crafted mouthwatering pastries, we settled at an outside table and ordered coffee. My girlfriend ordered something on the menu called black beans with egg and two salsas and I ordered my usual. Thank goodness she decided on those beans and gave me a slurp! Because a late breakfast of savory black bean soup topped with a crouton and poached eggs is an unexpected winner! We’ve since returned to that corner café and I’ve enjoyed their amazing flavorful black bean soup with eggs all to myself. This is my best recollection of that soup. Start with a flavorful broth. For aroma and texture unbeknownst to beans from a can, you really should build your soup with homemade black beans. That said, if you want to make this soup on the fly, open a couple of cans of black beans and supplement with a rich vegetable broth. 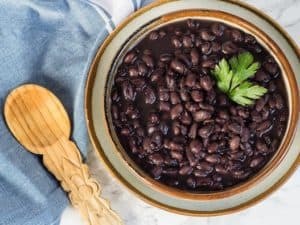 With either homemade or canned beans, you’ll find this black bean soup quietly fabulous. Toast some baguette slices with a little olive oil, one or 2 per person. Choose your salsa. 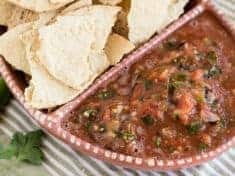 My homemade tomato salsa is 5-ingredient, 10-minute easy, though, the same as with the canned beans, if it comes down to making this soup or not, go with purchased salsa. Poach an egg or two per person. 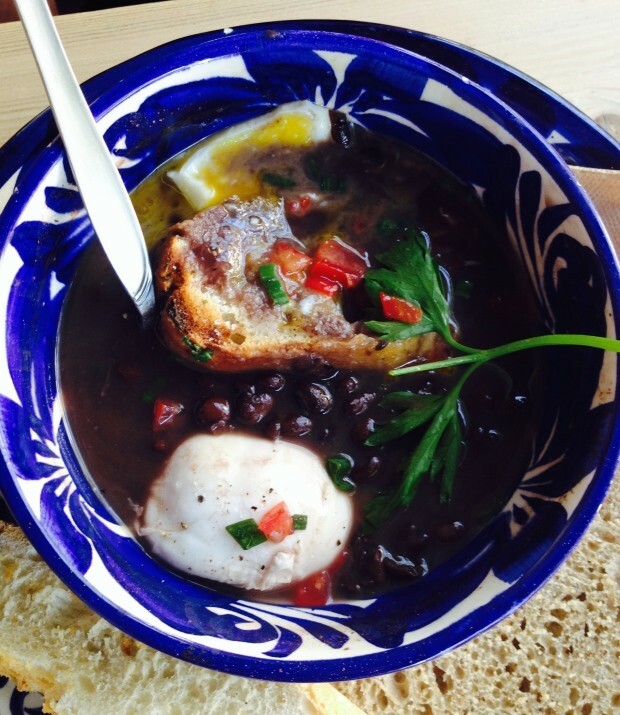 Our Mexico City black bean soup held 2 poached eggs. This recipe calls for 1 egg and one crostini toast per person. Feel free to include 2 eggs per person. 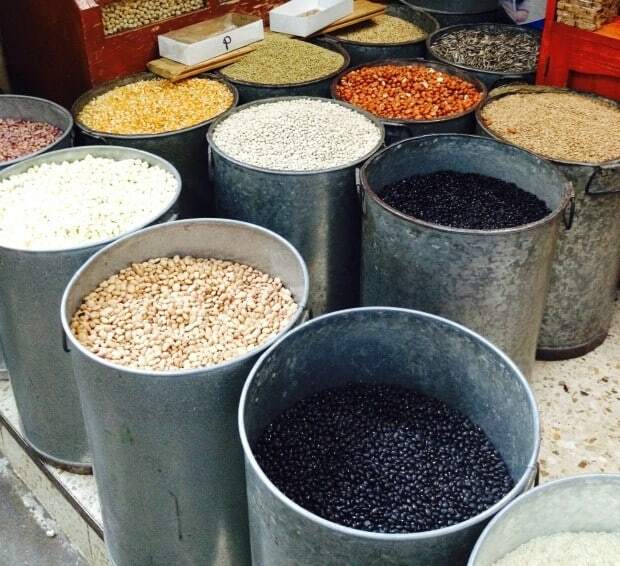 To prepare ahead: Make the black beans even several days before. To serve, reheat, then drop a crouton and egg on top. Salsa of course! Robbie and I are used to a less savory breakfast, so we have this soup for lunch or dinner. Though as an unexpected brunch item, Mexican black bean soup with poached egg and salsa delights. You and the folks you invited over–your tummies will be purring with content. Make it an awesome week. Get in the kitchen and cook a simple delicious Mexican meal! You might also like this Spicy Black Bean Chili with Hearty Greens. 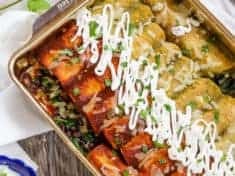 And these Spinach and Black Bean Enchiladas! Once you have all the components ready, black bean soup topped with eggs is a breeze to complete. The times in this recipe assume you have prepped the beans and the salsa ahead of time. While the beans cook, brush a little olive oil on the baguette slices and toast them to just golden. When the eggs are ready, ladle some beans into a bowl, float the crostini, and gently slide the poached egg on top. Spoon on the salsa. Finish with a twist of freshly ground black pepper and a sprig of flat-leaf parsley. 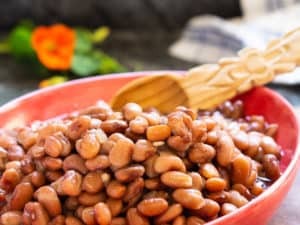 If you don’t have home cooked beans, use 2 cans black beans, drained, and 1 ½ to 2 cups of vegetable broth. If you wish, flavor the broth with ½ cup sautéed onion and 1 minced garlic clove. Homemade salsa, with fresh tomatoes, green chiles, onion and cilantro is first choice, though a good quality purchased salsa saves time.